Get him to the brit on time. 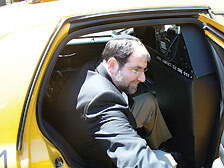 Cantor Philip Sherman takes off by cab to perform another circumcision. 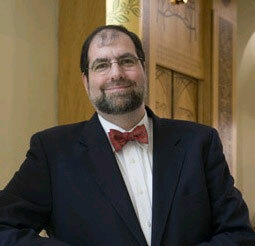 Cantor Philip Sherman is a busy man. Having performed his first brit mila of the day at the Ritz Carlton in New York City, he is out the door, whistling for a cab and apologizing for the rush. He has three more circumcisions today, the last of which is scheduled for the late afternoon, dangerously close to Shabbat. Perhaps it's not surprising that New York's leading mohel, who performed the circumcisions for the sons of actress Rachel Weisz, PR pro Lizzie Grubman, actor Richard Kind and sportscaster Iain Eagle, has a record of nine such ceremonies a day. What is surprising is that a growing number of Sherman's clients are not Jewish. With more than 18,000 operations under his belt, Sherman calls his services to non-Jewish clients "holistic circumcision," and feels it's all very natural. "Holistic circumcision reflects an ancient technique in modern context," he says. "The technique is holistic by nature. It's the most efficient, quickest and gentlest way [to circumcise], a combination of technical skill and spirituality, and whether it's Jewish, interfaith or non-Jewish, that context exists." When their son Louis Michael was born, Rev. Louis DeCaro, an evangelical pastor, and his wife, Michele Sweeting, an educator and gospel recording artist, didn't know much about mohalim. "We had assumed that a circumcision would be performed routinely but discovered after the fact that he would not be circumcised unless we scheduled what amounted to a separate in-patient hospital procedure - a surgery," says DeCaro. The couple searched for an alternative and their pediatrician suggested a mohel and recommended Sherman, who performed the circumcision at their home. DeCaro and Sweeting say they were touched by a moment which they wouldn't have witnessed if Louis Michael had been circumcised in the hospital like thousands of other baby boys every year. "Although it was not a religious matter for us, it was very special - something more than a procedure or surgery," says DeCaro. "In fact, it really struck me that Cantor Sherman said, 'I don't do circumcisions.' In other words, it was no mere cutting of the flesh for him; it was of religious significance, something very reverent and he was sharing that with us, with our son, even though we are not Jewish." For Sherman, an associate cantor at the Spanish and Portuguese Synagogue on the Upper West Side, this is part of his general mission to make circumcision as easy as possible on the baby and his parents. Born in Syracuse, Sherman was studying to be a cantor. "My grandfather was a mohel. I didn't know if I would make a good hazan, so I learned to be a mohel," he says. In 1977 he spent a year training with Rabbi Yosef Halperin, chief mohel of Jerusalem. Even during his initial training, he witnessed a non-Jewish circumcision, when his mentor was asked to perform the ceremony for the son of the Italian ambassador. "The British royal family always used a mohel," says Sherman, whose clientele is composed of 30-40% non-Jews and interfaith couples. Gentile families' choice to hire his services doesn't seem odd to Sherman. He describes the hospital circumcision as a situation in which "the baby is strapped down to a cold, molded plastic bodyboard, placed on a table and the procedure can take up to a half an hour or longer, depending on the ability of the individual doing the circumcision... It is very clinical and very difficult for the baby. The technique that I, and other traditional mohels, use is very different. The baby is not strapped down. Instead he is placed on a double pillow, on the lap of the sandak, held by warm, loving hands. With this technique, the brit takes 40 seconds or less." A growing number of non-Jewish families agree. Sherman's records show that the number of holistic circumcisions he has performed doubled from 14 in 2006 to 28 in 2007, and he expects the numbers to double again this year. He doesn't include interfaith families in these statistics. "If the mother is Jewish, the baby has a regular brit," he explains. "If the mother is not Jewish, the ceremony I perform is the first step in becoming Jewish, and I make sure the family knows that." At the same time, more and more Jewish couples opt for the hospital or doctor/mohel option. They do so, according to Sherman, because "they are not observant and because some doctors give receipts that can be submitted to the insurance companies." While he takes his job very seriously - "I don't tell jokes and I don't hand out refrigerator magnets" - one can't ignore Sherman's humor, which helps put nervous new parents at ease. Having explained the procedure to everyone present at the Ritz Carlton and playfully introducing himself to the great grandmother, Sherman calls to the newborn's mother: "Allison, I need a baby." The crowd laughs and the tension is lifted. Seeing him in action makes sense of his business card, which notes he's a member of the Screen Actors Guild. Sherman played the rabbi in a dot.com commercial with Whoopi Goldberg. No audition was required. The people connected with the commercial knew him from various circumcisions he had performed.